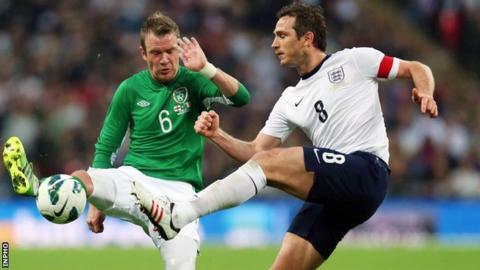 The Republic of Ireland will take on England in a friendly at the Aviva Stadium in Dublin in June next year. The teams met at Wembley in May 2013, and the Football Association of Ireland (FAI) said there was an agreement for a return game in Dublin. England have not played in the Republic since 1995, when a friendly had to be abandoned because of rioting fans at Lansdowne Road. The 7 June friendly will be England's first visit to the Aviva Stadium. Last year's London friendly ended 1-1, with Frank Lampard equalising after Shane Long headed the Republic into an early lead. The previous match between the sides in Dublin was called off after seats in the England section were ripped up and missiles thrown. "While inevitably the focus for Roy and his team is on Brazil and the World Cup, we are always planning further ahead and we are delighted to announce this fixture next summer," said Club England managing director Adrian Bevington. "It will be a significant moment for England to play in Dublin again, and due to the hard work by both organisations on many fronts we fully expect it to be a fantastic occasion enjoyed by both sets of fans." England have won five and lost two of their 14 matches against the Republic.